It has been more than a month since Julie Anne San Jose wowed Mall of Asia Arena with her dazzling rendition of the Moana theme song "How Far I'll Go". The Asia's Pop Sweetheart performed the Disney number at Globe's "I Dare To Dream" Show, alongside no less than Lea Salonga and other young music stars Morissette, Erik Santos, Christian Bautista, Aicelle Santos, Sam Concepcion and Tippy Dos Santos. You can watch her full performance in two parts below. Netizens were fast on posting their praises for Julie's performance on social media. They were also fast in comparing Julie's version with the original studio version of the song. Janella Salvador is one of the Southeast Asian vocalists chosen for the full studio version. Our birthday girl brushed the comparison aside, saying that there is no need for it. "Naku. Wala naman po kasi talaga dapat i-compare. Lahat naman ng mga singers, may kanya-kanyang rendition sa mga iba't- ibang kanta," Julie Anne said. "Ako naman, i just sang from the heart. It's important na ma-appreciate ng ibang tao." Music fans observed that despite the outstanding performances that night, it was Julie Anne who was the most applauded. In fact, her performance received several reaction videos from foreign YouTubers. For her part, the Kapuso prime talent just wanted to continue giving the audience, especially her fans memorable performances. She even sampled an a capella version of Jessie J's "Who You Are" during her birthday celebration with her fans yesterday at Paeng's Bowling Eastwood in Eastwood Citywalk. You can watch the video here. Julie also got emotional when asked for her birthday wish for boyfriend Benjamin Alves. "It's just really nice when you have someone na matatakbuhan mo kung may problema ka..."
"He always makes me happy. Salamat sa pagmamahal. Birthday wish ko sana wag siya magsawa. Sana 'wag niya akong iwan." 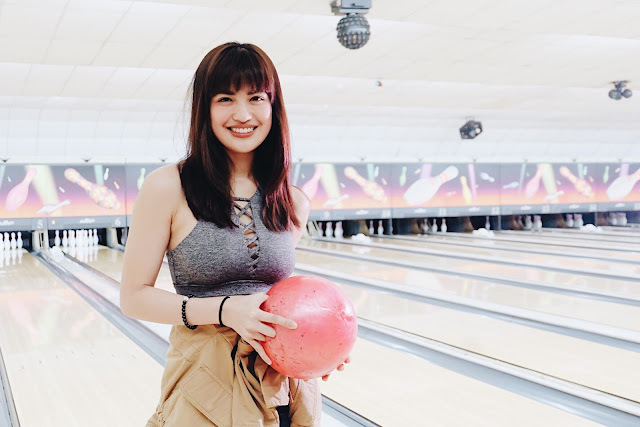 With Julie Anne San Jose at the bowling event are some of her most loyal fans. Making the event possible are Paeng's Bowling in Eastwood, Converse and Goldilocks.